Miles Traiser, 25, of Bismarck, North Dakota, came a long way for a wet run. But it was worth the trip for Traiser, who was the overall winner of the 2016 Asheville Marathon at Biltmore Estate on Sunday, March 13. The fourth annual race was warm, yet extremely soggy, with downpours throughout the 26.2-mile race that started at 7:30 a.m. and swept across the luscious grounds of the private Biltmore Estate. Runners also had to battle lost sleep after losing an hour to Daylight Saving Time the night before. Double bummer, but what an accomplishment for those who came out in the rainy dark to run 26.2 miles! Traiser finished in 2 hours, 53 minutes and 59 seconds, out of a field of 500. Arek Robinson, 29, of Asheville, finished second overall in 2:58:22, and in third was Josh Bernstein, 46, of Asheville, in 2:59:05. The female winner was Melissa Peters, 24, of Johnson City, Tennessee, in 3:09:27. She also finished 6th overall – impressive! And by the way, more women than men competed in the marathon this year. Go girls! Dominique Stasulli, 24, of Raleigh, N.C., placed second in the women’s race in 3:13:19, and in third was Aroline Hanson, 36, of Lansdale, Pennsylvania, in 3:24:52. For full Asheville Marathon results, visit www.ashevillemarathon.com. For a gorgeous photo gallery from the marathon, visit. www.CITIZEN-TIMES.com/outdoors. 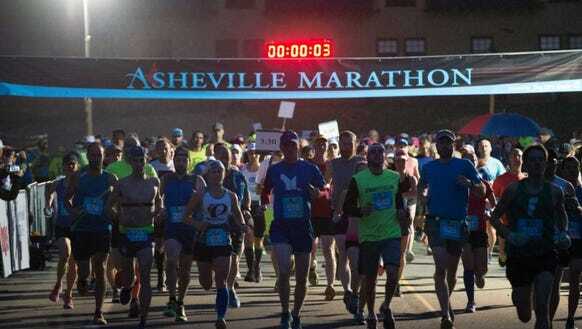 For more on the Asheville Half Marathon at Biltmore, which took place Saturday, March 12, see the Girls Gone Oudoors blog. The race was a benefit for three charity partners: Consider Haiti, an Asheville-based nonprofit that works to empower Haitian communities by supporting grassroots efforts to create sustainable nutrition and medical support; Cindy Platt Boys & Girls Club of Transylvania County, which serves more than 470 school-aged youth each year through their after-school and summer programs; and Young Life of Asheville/Buncombe County, which is dedicated to providing leadership and ministry for adolescents in the community.